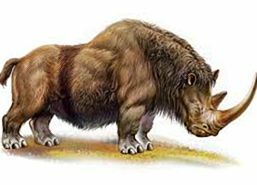 The extinct woolly rhinoceros was found on Vasilievsky Island. On the well-preserved remains of an ancient extinct animal - the builders of the theater came across when they dug a pit. On the 11th line of the Vasilievsky Island, 56 a theatrical playground "Theater. On takeaway" is building. However, the building had to be stopped: deepening the pit, the builders stumbled upon the remains of a young woolly rhinoceros that died out 14 thousand years ago.